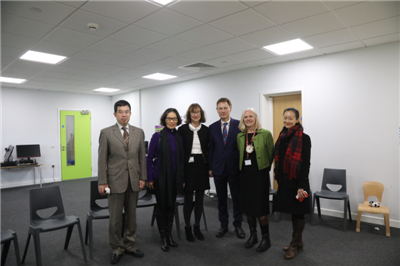 On March 14, 2019, Madam Hu Pinghua, wife of Chinese Ambassador to the UK and Head of Chinese Embassy Sunshine School visited Kensington Wade Prep School in London. Professor Hugo de Burgh, Chairman of Kensington Wade, and Joanna Wallace, Head Teacher of the school, were present. Professor Hugo de Burgh (third from right), Ms Wallace, Head Teacher (second from right) and Ms Katharine Carruthers, Governor of the school (third from left). 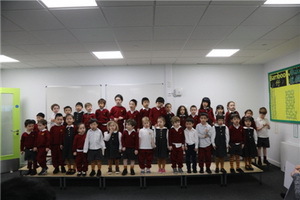 Madam Hu watched students’ dancing and singing in Chinese with great interest, and observed the immersive Chinese teaching at the reception class. Madam Hu exchanged views with the school representatives on school policy, funding, operation, teaching management, and the characteristics and difficulties of dual language teaching. Madam Hu said that she was delighted to visit this dual language English-Chinese prep school and found the immersive language teaching inspiring. She is willing to strengthen exchanges and work together with Kensington Wade to explore a dual language English-Chinese education suitable for children from both China and the UK. In today’s China, the pace of opening up is getting faster, and its door is opening wider. More and more British schools are beginning to offer Chinese language courses to satisfy the demand. “Chinese young people need to go out to learn the languages and cultures of other countries,” said Madam Hu. She also encouraged young people from other countries including Britain to learn Chinese language and culture, so as to lay a solid foundation for better communication and interconnection in the future. 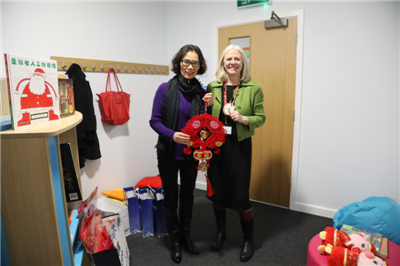 After the talks, Madam Hu, on behalf of the Chinese Embassy Sunshine School, presented books about Chinese culture and stickers with Chinese characteristics to Kensington Wade.